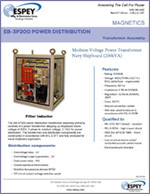 The EB-3P200 power distribution transformer assembly primarily consists of a power transformer stepping up shipboard mains voltage of 450V, 3 phase to medium voltage, 3.15kV for power distribution. 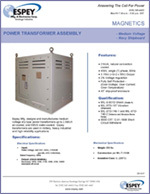 The transformer and distribution components are constructed in accordance with MIL-E-917 and fully enclosed for naval shipboard application. Espey Mfg. 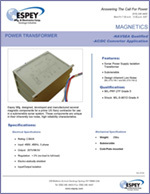 designs and manufactures medium voltage dry-type power transformers up to 2.5 MVA air-cooled. 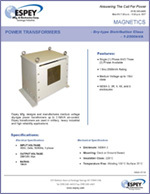 Espey transformers are used in military, heavy industrial and high reliability applications. Espey designed, developed and manufactured several magnetic components for a prime US Navy contractor for use in a submersible sonar system. These components are unique in their inherently low noise, high reliability characteristics.